On the day of the passing of Uri Avnery, the most right wing government in the history of Israel is engaged in negotiations with Hamas. Ironically, the same kind of demagogic accusations which were hurled at Uri Avnery throughout his life are now made against right-wing extremist Defense Minister Avigdor Lieberman. We in the Tikkun community and in our interfaith and secular-humanist-welcoming Network of Spirirtual Progressives, salute all those in Gush Shalom, in the remnants of the Israeli peace movement (tens of thousands of whom demonstrated against the new “Nation State Law” which Avnery was on his way to protest), and to Jews and people of all faiths who continue to support those of us who insist that the path to safety and security for the Jewish people and for Israel is a path of generosity, repentance, open-hearted reconcialition, and justice for the Palestinian people and a deep respect for the humanity that continues to emerge in all people on this planet despite the forces of violence and repression that are temporarily in ascendency. It is in maintaining that vision that we can best honor the memory of this amazing and wonderful human being whose passing from our world we grieve today. Rabbi Michael Lerner is editor of Tikkun, co-chair with Indian environmental activist Vandana Shiva of the Network of Spiritual Progressives, and rabbi of Beyt Tikkun Synagogue-Without-Walls in San Francisco and Berkeley, California. He is the author of eleven books, including two national bestsellers—The Left Hand of God and Jewish Renewal: A Path to Healing and Transformation. His most recent book, Embracing Israel/Palestine, is available on Kindle from Amazon.com and in hard copy from tikkun.org/eip. He welcomes your responses and invites you to join with him by joining the Network of Spiritual Progressives (membership comes with a subscription to Tikkun magazine). "I will tell you something about the Holocaust. It would be nice to believe that people who have undergone suffering have been purified by suffering. But it's the opposite, it makes them worse. It corrupts. There is something in suffering that creates a kind of egoism. Herzog [the Israeli president at the time] was speaking at the site of the concentration camp at Bergen-Belsen but he spoke only about the Jews. How could he not mention that others – many others – had suffered there? Sick people, when they are in pain, cannot speak about anyone but themselves. And when such monstrous things have happened to your people, you feel nothing can be compared to it. You get a moral "power of attorney", a permit to do anything you want – because nothing can compare to what has happened to us. This is a moral immunity which is very clearly felt in Israel." So sad that he hasn't survived to see his vision shared at top decision-making level in Israel. But may he rest in peace. "Avnery devoted himself entirely to the struggle to achieve peace between the state of Israel and the Palestinian people in their independent state, as well as between Israel and the Arab and Muslim World. He did not get to the end of the road, did not live to see peace come about. We – the activists and supporters of Tikkun magazine, as well as the members of Gush Shalom as well as very many other people who were directly and indirectly influenced by him – will continue his mission and honor his memory." I did not catch this & thanks for a kind reminder. I am so sorry to read this. A good man who tried to enlighten people. I know you shared many articles about him or things he wrote. I trust he will have a smooth journey to the Spirit World and may two more people pick up where he left off. Sad news. Thank you for letting us know, Evelyn. No his vision remains. Free Palestine. May his memory and comfort bring change and freedom for all. So sad to hear of his passing. 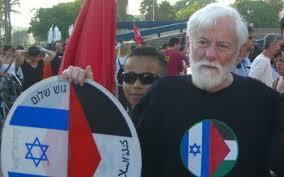 Uri Avnery's voice of reason will be missed so much. He was one of a kind. Re Evelyn's comment and quote above: "I will tell you something about the Holocaust. It would be nice to believe that people who have undergone suffering have been purified by suffering. But it's the opposite, it makes them worse. It corrupts. There is something in suffering that creates a kind of egoism." We see this in the schoolyard. The worst bullies are kids who are or were victims of bullying themselves, whether at home or at church or at a previous school. It is heartbreaking that it works this way but it does - most of the time, but NOT ALL of the time. One other important note is that many Israelis and visiting Jewish people have no idea what is really going on. Some are so overwhelmed by the propaganda; some are just blinded to the truth. And many young people are shielded from it until the propaganda and hate that taken hold. of course many do not know, and this is also kept from many, one way or another.. but there is a measure of complicity in this. in this age, with the internet, it is not as before; it is hard to ignore or pretend one knows nothing..
even when one only sees some things, or hear, some things.. one can always look or listen a little more, and seek out information, to know what is less visible or not easy to accept..
unless one does not wish to, and/or one is too 'busy', or not interested to do so, and hence, turning away is more comfortable, or 'easier', than facing harsh truths. There may always be those, who remain silent, for reasons, that may not be so different.. as those who stand by, seeing bullies in the playground, but won't take a stand. Barry - a very fair assessment! Thank you for stressing how many visitors to Israel are unaware of the abuses - propaganda & careful shepherding away from situations which might trigger awareness are widely used. And any visiting Jews who SEEK to see something of the other side are treated roughly - psychologically if not physically.